Never has a minister bearing new legislation seemed so unenthusiastic about the task. Last week, when Communications Minister Stephen Conroy announced that the Gillard Government was proposing to overhaul the regulation of Australia's news media, his demeanour suggested he did not expect it to happen, and perhaps that he did not really want it to happen. The necessary bills must be passed by the end of this week, Conroy said, or the Government would let the matter drop. He insisted that the package was not negotiable: there would be none of the by now familiar haggling with crossbench MPs to secure their support. Since most of these quickly declared doubts about aspects of the bills, the project appeared to be doomed. It still does, despite some wavering by Prime Minister Julia Gillard, who has hinted that an amendment or two might be accepted after all. For their part, the bullying proprietors have obliged by playing well and truly to type. 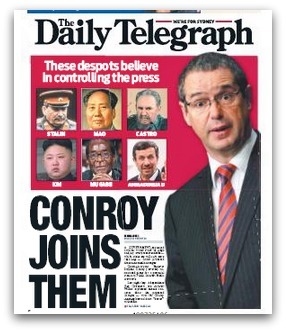 The day after Conroy's announcement, News Ltd's Sydney tabloid, the Daily Telegraph, produced a collectors-item front page that luridly and absurdly compared the minister with a swag of most brutal dictators of the past century: Josef Stalin, Mao Zedong, Fidel Castro, Robert Mugabe, Kim Jong-un and Mahmoud Ahmadinejad. The message was that, just like all of these beasts, Conroy was an enemy of free speech, democracy and civilisation as we know it, and the proof lay in his plans to muzzle the media. This line, only slightly muted, has been repeated in the Telegraph's News Ltd stablemates ever since. 'Fight for Freedom' Melbourne's Herald Sun screamed, a splash head glossed with the overline 'Media giants warn Conroy power grab threatens us all'. Among the 'giants' was, of course, News Ltd chief Kim Williams, who, not to be outdone by his tabloid underlings, told a Senate committee hearing that the proposed new regulatory regime would be a star chamber. In assailing the legislation Williams received rare support from other media CEOs, including Fairfax's Greg Hywood and Seven West Media's Kerry Stokes. 'What have we done to deserve this?' bleated Stokes. So just what is it that Conroy is proposing that will supposedly end free speech and impose government censorship on the media? The six bills, if they become law, will introduce various changes, some of which, such as amending the charters of the ABC and SBS to acknowledge them as internet publishers, merely authorise something which has already happened. But two reforms are contentious: the creation of a new statutory official, the Public Interest Media Advocate, and the introduction of a public interest test for future mergers and acquisitions by media companies. The Advocate would administer the public interest test and accredit voluntary media regulators, such as the existing Australian Press Council and any similar bodies the industry may choose to create. That's it. There would be no direct government intervention in the operation of the media, still less anything resembling censorship. The Advocate's oversight of the voluntary regulators would consist in ensuring that they adhere to the codes of practice they have set for themselves. The existing codes in the industry, such as that prescribed by the journalists' union, the Media, Entertainment and Arts Alliance, would still apply. And, although the Advocate would be a government appointee, they would operate at arm's length from the government, like the Australian Communications and Media Authority, which regulates broadcasting. As Gillard and Conroy pointed out, no one ever suggests that ACMA takes its orders from the government of the day. This is to be compared with the murderous depradations of Stalin, Mao and Mugabe? Or, only slightly less incongruously, with the 17th century Court of Star Chamber, which dispensed summary and often secret justice to political opponents of Britain's Stuart monarchs? The changes Conroy is proposing do not even credibly compare with the super regulators recommended by the Finkelstein inquiry in Australia and the Leveson inquiry in Britain. Free speech is not at risk, and the media companies know that it is not. Their real fears surely concern the Advocate's other task: to determine whether future mergers and acquisitions are in the public interest. It is self-interest, not concern for the rights and freedoms of citizens, that is motivating the outcry. Australia's print media are already concentrated in too few hands, with one company owning more than two thirds of metropolitan mastheads. This lack of diversity is in itself a danger to democracy, but you'll never hear Williams or his counterparts in other companies admit it. The feather-duster regulatory regime envisaged by Conroy would scarcely even challenge the power of existing media companies, but even the possibility of such a challenge is something they will not countenance. And if the Government's diffident approach to reform is anything to go by, Gillard, Conroy and their colleagues might also feel relieved, in this election year, if the reforms are stillborn. Ray Cassin is a contributing editor, and a former member of the Australian Press Council. What astonishes me is how short Labor's memory is. Doesn't anyone in the Gillard government remember Moss Cass? As Gough Whitlam's minister for the media in 1975 his modest proposal for a press council sent Rupert Murdock into a frenzy, his attack on the then Labor government was so vitriolic that a number of his own journalists went on strike in protest. Murdoch's assault on Whitlam may not have been the sole cause of his downfall but it certainly was a major contributor. With that sort of history behind them it beggars belief that Stephen Conroy can now poke a stick into the hornet's nest with so little thought or preparation. Thanks, Ray. We have come to a moment of great danger in the history of our country. Back in the seventies, Murdoch didn't have the stranglehold he has now, and Fairfax and the ABC maintained a degree of independence that they no longer display. I agree with Paul that there are problems with the whole matter of how this legislation has been brought forward for discussion, particularly the very short time-frame for debate, but the legislation itself is necessary - we really must not allow any further concentration of ownership in such a powerful and already concentrated arena, nor do we want the Murdoch Press to be allowed to behave the way it has in Britain. But more importantly, we do not want to see Prime Ministers being forced out and governments brought down (even the ones we don't like) because ONE man doesn't like them and has the media clout to get away with lies, misrepresentations, and the failure to cover inconvenient facts - and any other behaviours that might suit his purpose. The proof will be in the pudding, and history will judge us harshly if we allow the mainstream media to continue down the path they are on. Conroy is a Rudd supporter. Conroy has run this whole process as incompetently as he possibly could, to add fuel to the fire against Gillard. Gillard has now joined Conroy in trying to muster support but she is doomed to fail, which is clearly what Conroy wants. Conroy is a fifth-columnist, working for Rudd. There can be no other possible explanation for the poor handling of the legislation, unless Conroy is truly inept and a political dunce. He is also a hard rightwing Catholic who would be deeply offended by Gillard's nominal leftwing status plus her agnostic position - she never said she was an 'atheist', that was another media/commentator confection to asault her with. As for NewsCorp, the business is a total disgrace with flunky 'journalists' doing whatever Murdoch wants. Fairfax is going downhill fast and trying to become more like NewsCorp. Both print organisations need to be broken up and sold off, preferably not to 'institutions'. Commercial radio could be closed down and no one would be any less informed, as with commercial TV - all total rubbish and existing only as advertising vehicles. If Mr Cassin would spell out exactly what the "Public Interest Test" will be that Labour/Conroy has in mind, then we all might be a little wiser as which end of the feather duster he is referring to, and so whether or not free speech is at risk. May I suggest that the public interest test is adjudicated in similar ways to our church - with the nihil obstat imprimatur that gives it the tick of doctrinal approval? The power of social media was manifest during the days following the announcement. Images of the Pope washing and kissing the feet of women, cancer and AIDS patients, and the poor, went viral. Francis himself recognised that the often maligned and misunderstood work of the media can play a part in spreading a message of justice.